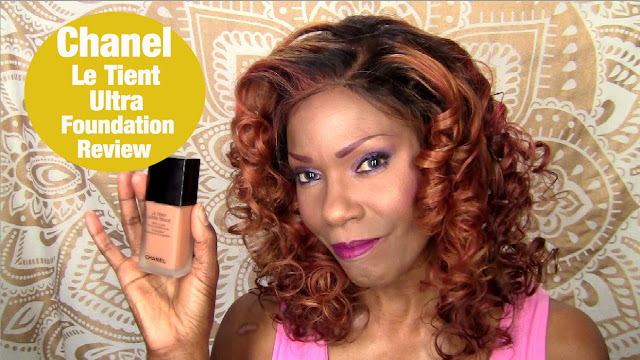 I was searching for a new foundation so I decided to research Youtube and see what I could find that was lightweight. I picked the Chanel Le Tient Ultra Tenue foundation in 121 Caramel because most video reviewers that I watched said it was very lightweight and soft on the skin. I don't like a full coverage or really thick foundation because it just slides off due to the fact that i'm in menopause and could break out in a sweat at any given moment! So I normally don't wear a lot of foundations because of that and also that I'm retired and have no reason to wear it daily. But I like how my skin looks in photographs when i'm doing fashion post so I thought it was worth the investment. As a beauty influencer with my own Youtube channel, I love showing my viewers how certain products looks and performs on my skin. So I did a video demo on this Chanel Le Tient Ultra Tenue foundation as well and I have included the video below if you're interested in watching. Product: Experience flawless wear that moves with you. This fluid,longwearing foundation glides on smoothly for a seamless second-skin effect. Composition: A light-diffusing complex creates natural luminosity, while absorbent powders leave a perfect matte finish. Amino-acid coated pigments deliver weightless coverage for a lasting, flawless look. In 16 seamless shades. How to Apply: Apply directly onto the face with fingertips or a foundation brush. Build coverage, from medium to full. I fount the Chanel Le Tient Ultra Tenue foundation in 121 Caramel to be extremely lightweight almost featherless. It's pretty sheer with light coverage. It's buildable for those of you that want more coverage but you still might need to use some sort of foundation powder that compliments the color for that extra coverage. It blends out true to color and did a pretty good job covering my imperfections. After I applied the foundation in the video demo, I wore it all day until I washed it off at night, so I had a total of about 8 hours of wear and I didn't experience any streaking or sliding. Normally I do sweat a little because i'm in menopause so I did experience some foundation coming off when I blotted my face with a tissue to when I was perspiring. Other than that, it lasted pretty much all day with great coverage.